On August 31, 2005, at the age of 85, Ed Brown navigated his way back home from Natchez to reopen the Hammond U-Haul Center. Ed had heard reports that Katrina knocked out Hammond’s power lines and that many, if not most roads were impassable. But that didn’t matter to Ed. He knew that people needed help … and he was going to do everything in his power to make sure it was provided. 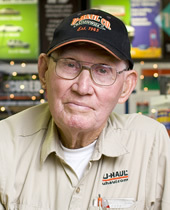 Ed Brown is the oldest active U-Haul employee in the United States, a distinction he has held for the past 6 years. Years of experience taught Ed that his trucks and trailers move more than furniture and equipment. They move peoples’ lives – their memories and their hopes for the future. Now more than ever, Ed knew he needed to get that store open. Additionally, he had propane tanks and supplies that would surely be welcomed by a community deprived of power and fuel. Ed and his wife left their Natchez evacuation location and drove toward Hammond. Eventually blocked by fallen trees and power lines, Ed climbed through a ditch to get back home. Now resettled at home, Ed made his way to the store and launched into what he does best – taking care of others. If you ask Ed, he’ll tell you that he does a little bit of everything at the store, from helping customers and maintaining trailers to keeping the place neat and clean. Most importantly, he’s there when you need something – even if it’s just a funny story, a warm smile or the peaceful reassurance of knowing that trust and integrity still flourish in our state. Ed Brown … Peoples Health Champion.